This investigation of the Eagle Mountain Mine area, though cursory, revealed new structural, alteration, and stratigraphic relations. Eagle Mountain ores were previously an important source of iron to the western U. S. Ore (where fresh) is magnetite-pyrite rock forming two stratabound horizons virtually continuous for 11 km. Gneissic basement rocks are overlain by two sedimentary units, separated by unconformities. The lower unit contains carbonate rocks and quartzite; the "vitreous quartzite" of previous workers, however, is an alteration feature rather than a stratigraphic one. The upper unit contains thick conglomerates. This layered sequence of rocks is deformed into a west-plunging anticline. Intrusion by Jurassic quartz monzonite apparently followed this deformation. a north-facing monoclinal plane between folds, which was preferentially replaced. Iron ore replaces a variety of host rocks along the two unconformities, forming massive to globular bodies, and its mineralogy correlates with deuteric alteration features, not anhydrous skarn. Its pyrite contains as much as 3% cobalt. Iron was only one of five elements that showed mobility in this region on a scale that suggests basic crustal processes. The others in probable order of flux magnitude are silica, magnesium, sodium, and potassium, to form regionally distributed “vitreous quartzite”, dolomite, and secondary feldspars, respectively. 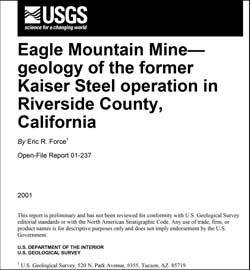 Force, Eric R., 2001, Eagle Mountain Mine- geology of the former Kaiser Steel operation in Riverside County, California: U.S. Geological Survey Open-File Report 01-237, 17 pp., https://pubs.usgs.gov/of/2001/0237/.